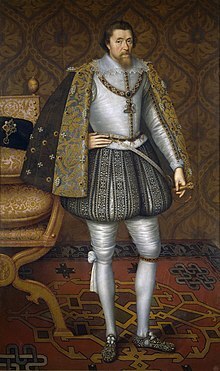 James VI & I (19 Jun, 1566 – 27 Mac, 1625) adalah Raja Scotland sebagai James VI bermula pada tahun 1567 hingga 1625, dan Raja England dan Ireland sebagai James I bermula pada 1603 hingga 1625. Beliau menjadi Raja Scotland sebagai James VI pada 24 Julai, 1567, semasa beliau berumur 13 bulan, mengantikan ibu beliau Mary, Ratu Scotland. Pemangku raja memerintah semasa beliau kecil, yang mana tamat secara rasminya pada tahun 1578, meskipun beliau tidak mendapat kuasa sepenuhnya ke atas kerajaan beliau sehingga tahun 1581. Pada 24 Mac, 1603, sebagai James I, beliau mengantikan raja England dan Ireland terakhir dari Dinasti Tudor, Elizabeth I, yang mangkat tanpa waris. Beliau kemudian memerintah Kerajaan England, Scotland, dan Ireland selama 22 tahun, sering menggunakan gelaran Raja Great Britain, sehingga kematian beliau pada umur 58 tahun. Di bawah pemerintahan James, "Zaman Keemasan" sastera dan drama dari era Elizabeth diteruskan, dengan para penulis seperti William Shakespeare, John Donne, Ben Jonson, dan Sir Francis Bacon memberi sumbangan budaya kesasteraan yang maju. James juga merupakan seorang sarjanawan yang berbakat, dan merupakan penulis bagi kerja-kerja seperti Daemonologie (1597), True Law of Free Monarchies (1598), and Basilikon Doron (1599). Sir Anthony Weldon mendakwa bahawa James disebut sebagai "si si bodoh dalam Dunia Kristian", satu gelaran berkaitan dengan perwatakan beliau sejak itu. ^ Stewart, p 47; Croft, p 16; Willson, pp 29–31. ^ By the normal rules of succession James did have the best claim to the English throne, as the great-great-grandson of Henry VII. However, Henry VIII's will had passed over the Scottish line of his sister Margaret in favour of that of their younger sister Mary Tudor. In the event, Henry's will was disregarded. Stewart, pp 159–161; Willson, pp 138–141. ^ After the Union of the Crowns James was the first to style himself "King of Great Britain", but the title was rejected by both the English Parliament and the Parliament of Scotland, and its legal basis was open to question. Croft, p 67; Willson, pp 249–52. See also: the early history of the Union Flag. ^ "James VI and I was the most writerly of British monarchs. He produced original poetry, as well as translation and a treatise on poetics; works on witchcraft and tobacco; meditations and commentaries on the Scriptures; a manual on kingship; works of political theory; and, of course, speeches to parliament...He was the patron of Shakespeare, Jonson, Donne, and the translators of the "Authorized version" of the Bible, surely the greatest concentration of literary talent ever to enjoy royal sponsorship in England." Rhodes et al., p 1. ^ "A very wise man was wont to say that he believed him the wisest fool in Christendom, meaning him wise in small things, but a fool in weighty affairs." Sir Anthony Weldon (1651), The Court and Character of King James I, quoted by Stroud, p 27; "The label 'the wisest fool in Christendom', often attributed to Henry IV of France but possibly coined by Anthony Weldon, catches James’s paradoxical qualities very neatly." Smith, p 238. Atherton, Ian; and David Como (2005). The Burning of Edward Wightman: Puritanism, Prelacy and the Politics of Heresy in Early Modern England. English Historical Review, Volume 120, December 2005, Number 489, 1215–1250. Oxford: Oxford University Press. Barroll, J. Leeds (2001). Anna of Denmark, Queen of England: A Cultural Biography. Philadelphia: University of Pennsylvania. ISBN 0-8122-3574-6. Barroll, J. Leeds and Susan P. Cerasano (1996). Medieval and Renaissance Drama in England: An Annual Gathering of Research, Criticism and Reviews. Fairleigh Dickinson University Press. ISBN 0-8386-3641-1. Bucholz, Robert and Newton Key (2004). Early Modern England, 1485–1714: A Narrative History. Oxford: Blackwell. ISBN 0-631-21393-7. Noble, Mark (1795). An Historical Genealogy of the Royal House of Stuarts, from the Reign of King Robert II to that of King James VI. London: R. Faulder. Read complete digitized copy at Google Books. Retrieved 19 April 2007. Perry, Curtis (2006). Literature and Favoritism in Early Modern England. Cambridge; New York: Cambridge University Press. ISBN 0-521-85405-9. Rhodes, Neil; Jennifer Richards; and Joseph Marshall (2003). King James VI and I: Selected Writings. Ashgate Publishing, Ltd. ISBN 0-7546-0482-9. Sharpe, Kevin M. (2000). Remapping Early Modern England: The Culture of Seventeenth-century England. Cambridge: Cambridge University Press. ISBN 0-521-66409-8. Smith, David L (2003). "Politics in Early Stuart Britain," in A Companion to Stuart Britain. Ed. Barry Coward. Blackwell Publishing. ISBN 0-631-21874-2. Solt, Leo Frank (1990). Church and State in Early Modern England: 1509–1640. Oxford: Oxford University Press. ISBN 0-19-505979-4. Watts, Michael R (1985). The Dissenters: From the Reformation to the French Revolution. Oxford: Oxford University Press. ISBN 0-19-822956-9. Williams, Ethel Carleton (1970). Anne of Denmark. London: Longman. ISBN 0-582-12783-1. The Diary Of Samuel Ward: A Translator Of The 1611 King James Bible, edited by John Wilson Cowart and M.M. Knappen. Akrigg, G. P. V (1978). Jacobean Pageant: The Court of King James I. New York: Atheneum. ISBN 0-689-70003-2. Chambers, Robert (1856). "James VI". Biographical Dictionary of Eminent Scotsmen. London: Blackie and Son. Fraser, Antonia (1974). King James VI of Scotland, I of England. London: Weidenfeld and Nicolson. ISBN 0-297-76775-5. Houston, S J. James I. Longman Publishing Group (June 1974), Seminar Studies ISBN 0-582-35208-8. Lee, Maurice (1990). Great Britain's Solomon: James VI and I in his Three Kingdoms. Urbana: University of Illinois Press. ISBN 0-252-01686-6. Lockyer, Roger (1998). James VI and I. Longman. 2nd edition. Lockyer, Roger (1999). The Early Stuarts: The Political History of England 1603-1642. Longman. Lynch, Michael (historian) (1991). Scotland: A New History. Ebury Press. ISBN 0-7126-3413-4. Peck, Linda Levy (1982). Northampton: Patronage and Policy at the Court of James I. Harper Collins. ISBN 0-04-942177-8. Williamson, David (1998). The National Portrait Gallery History of the Kings and Queens of England. London: National Portrait Gallery. ISBN 1-85514-228-7. Wikimedia Commons mempunyai media berkaitan: James VI dan I.
Laman ini diubah buat kali terakhir pada 09:45, 20 November 2015.